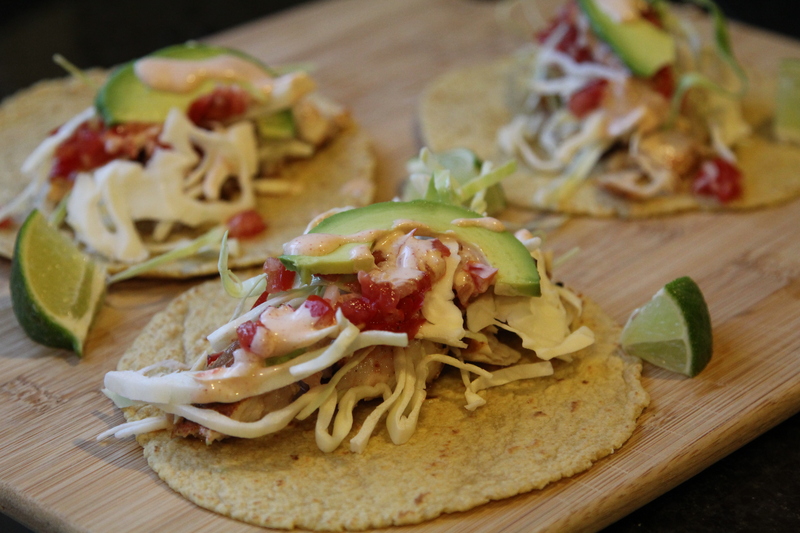 Fish Tacos [recipe] – Cin Cin, Let's Eat! Here we are, fish tacos for dinner! I like to prepare lots of different condiments and toppings so that people can choose what they like and assemble their own tacos. I do the same for burgers and host burger parties in the summer. For me, the key ingredients in fish tacos are corn tortillas, grilled fish rubbed with spices, cabbage (shredded cabbage or slaw), tomatoes (salsa, or diced up plain), avocados (slices or guac), your favorite hot sauce (straight up AND mixed with mayo or sour cream), and lots of lime wedges. I will explain in the directions below. 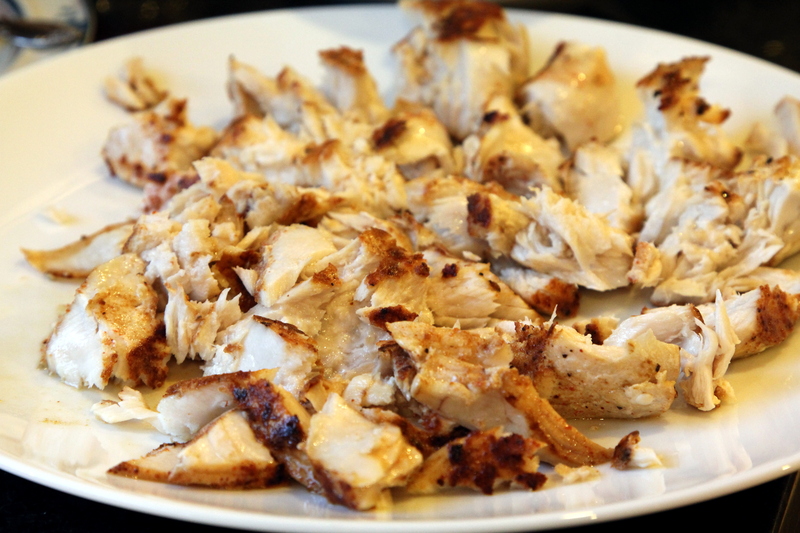 Fish: Any firm fishes are great for tacos, such as Ono, Wahoo, Tilapia, Halibut…etc. Usually I find that 1 lb of fish serves two people, very generously. 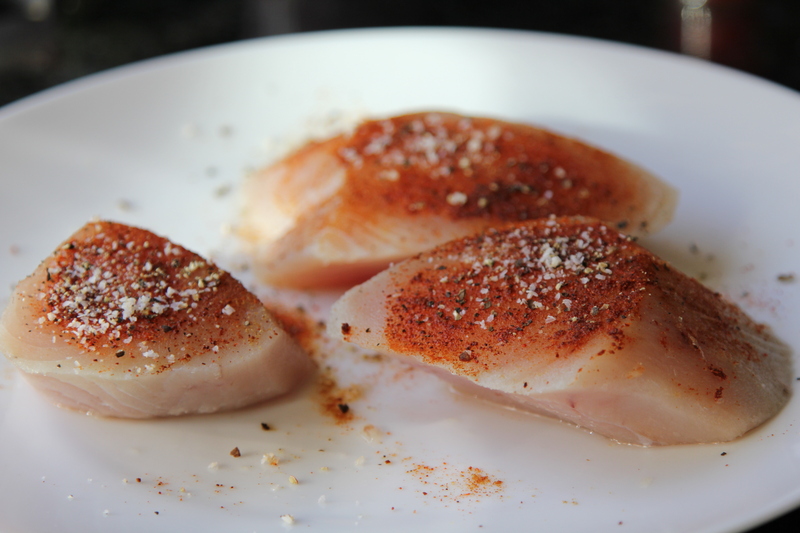 Rub fish with seasoning: salt, pepper, paprika, cumin, cayenne, garlic powder, chili…etc. Whatever your heart desires. If you like a more subtle taste, simply season with salt and pepper. Grill 3-5 minutes per side. Don’t overcook the fish! Use a fork to tear the cooked fish into flakes. If frying (Baja style) is more your thing, coat the fish in batter and fry away. Cabbage: This is sort of a California take on fish tacos. I kept it plain, just shredded. Jazz it up by making a coleslaw, or mix with some cider vinegar. Red cabbage tastes great in fish tacos too. Tomatoes: Plain diced or salsa (4 large tomatoes + 2 minced garlic cloves + 1 small onion diced + jalapeno + hot sauce + salt&pepper). Sometimes I make a mango salsa instead. Avocados: Thinly sliced. Or make guacamole! Hot Sauce: My favorite brand is Tapatio! But any brand you like will work. I mix the hot sauce with either mayonnaise or sour cream. Spoon the mixture over the final product, For extra kick, drizzle more hot sauce on the tacos! Corn Tortillas: Toss it on the grill or warm it over the stove on a skillet just before serving. I do prefer the taste of corn tortillas over flour tortillas when it comes to fish tacos. The flavor of the corn really compliments all the fixings. Limes: Hit the tacos with lots of lime! The citrus helps to bring out the all the spices on the fish. Those look perfect. One of the things I miss most about living in California, good Mexican restaurants. Your fish looks super fresh and perfectly grilled!